Summary of Hypertension Hypertension can be divided into primary (essential) and secondary hypertension (a result of an underlying condition, ie. renal artery stenosis). It is important to identify wether this is an underlying cause of the hypertension based on history, risk factors and by ordering appropriate tests. Untreated, undiagnosed and poor compliancy can result in and hasten end organ damage. Lifestyle changes is the corner stone of treatment. The mean arterial pressure (MAP) is a term used in medicine to describe an average blood pressure in an individual. MAP is a product of cardiac output and the total peripheral resistance. Worldwide, raised blood pressure is estimated to cause 7.5 million deaths, about 12.8% of the total of all deaths. Raised blood pressure is a major risk factor for coronary heart disease and ischemic as well as hemorrhagic stroke. Blood pressure levels have been shown to be positively and continuously related to the risk for stroke and coronary heart disease. Globally, the overall prevalence of raised blood pressure in adults aged 25 and over was around 40% in 2008. The proportion of the world’s population with high blood pressure, or uncontrolled hypertension, fell modestly between 1980 and 2008. However, because of population growth and ageing, the number of people with uncontrolled hypertension rose from 600 million in 1980 to nearly 1 billion in 2008. Risk Factors for hypertension are essentially the same for other cardiovascular diseases. Hypertension is a common disorder that affects a large proportion of the community. It is usually asymptomatic and is detected on routine examination or after the occurrence of a complication such as a heart attack or stroke. It is often referred to as the silent killer. 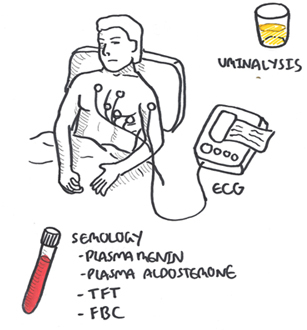 Remember Several things can cause bias to the hypertension readings (White coat hypertension). In the clinic, usually the 1st measurement is disregarded and the average of the second and third readings are taken. This is the most common situation, when no underlying cause can be found to account for raised blood pressure. In a minority of cases, an underlying, often reversible cause can be found. Think Renal artery stenosis should be suspected if BP is unexpectedly low or kidney function deteriorates in patients taking an ACEI or ARB. The aim of early diagnosis and treatment of hypertension is to lower overall cardiovascular risk and prevent cerebrovascular events. The effects of chronic hypertension on organ systems are referred to as target (end) organ damage. 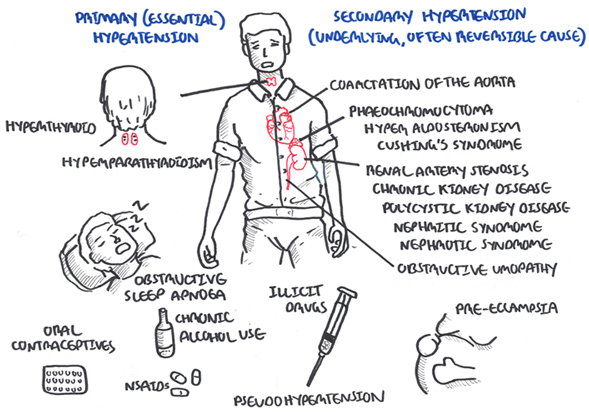 Corner stone of managing primary hypertension is modifying poor life-style choices (ie. 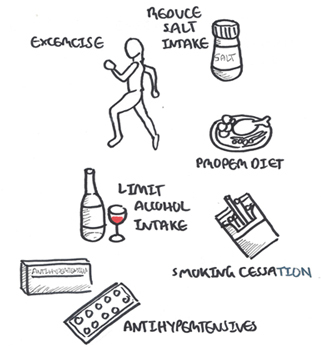 diet, smoking cessation). Antihypertensive medication are recommended for patient at high risk of cardiovascular disease and who have moderate-severe hypertension. Secondary causes of hypertension may require surgery and additional medications. Antihypertensives first line Patients commonly require two or more drugs in combination to reach BP targets. Pharmacology Ace inhibitors work by inhibiting the membrane bound enzyme ACE which usually converts Angiotensin I to Angiotensin II. Angiotensin II is a very strong sympathetomemetic increasing heart rate and contracitliy as well as being potent vasocontrictor. Side effect of ACE include dry cough, hyperkalaemia, angioedema and rash (+/- nausea, diarrhea, etc). Contraindications include chronic cough, allergy, pregnancy and renal failure. Alternative drug for ACE is ARBs which work just as effectively. In Diabetes reduction of BP to outcome is unclear. 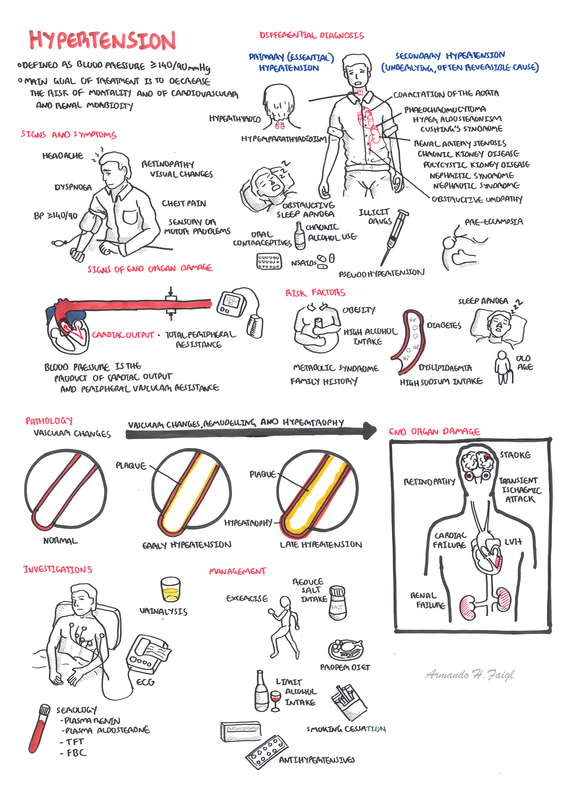 Hypertensive Urgency is defined as BP ≥140/90 mmHg. 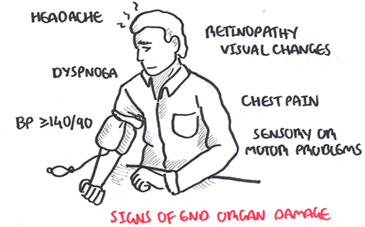 Hypertensive Emergency is elevated BP (usually systolic BP >210 mmHg and diastolic BP >130 mmHg) with rapid deterioration of vital organ function, resulting in symptoms such as encephalopathy, retinopathy, myocardial ischaemia, or renal failure. 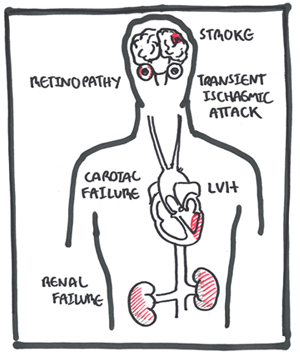 Hypertensive emergency is elevated BP (usually systolic BP >210 mmHg and diastolic BP >130 mmHg) with rapid deterioration of vital organ function, resulting in symptoms such as encephalopathy, retinopathy, myocardial ischaemia, or renal failure. 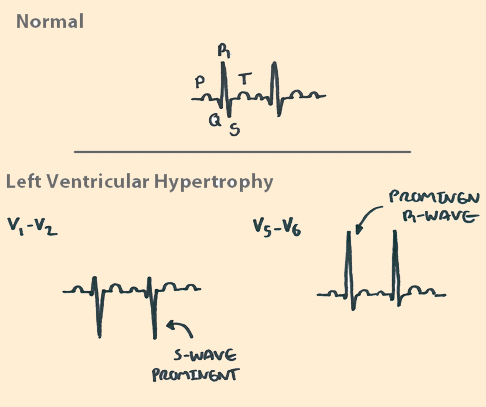 The absolute value of the BP is not as vital as the presence of acute end-organ damage. If untreated heart, neurological and renal impairment may ensue.